CHUNKY SALSA THAT ADDS SIZZLE TO ANY MENU! Enjoy the genuine Mexican taste of all natural ingredients available in two rich and thick varieties! The thick, rich texture and bold chunks of tomatoes, onions and fresh jalapenos make this a great versatile dip, topping or additional to any meal. 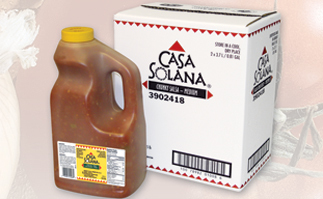 Casa Solana Chunky Salsa provides consistent fresh flavour and appearance. As flavour enhancers, Casa Solana Chunky Salsa can be used across all day parts, on a wide variety of menus. With no prep needed - just shake, open and pour!